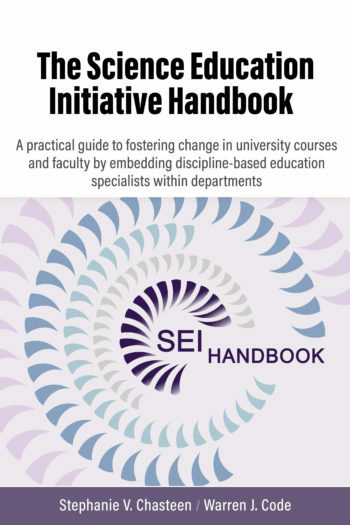 Subtitle: A practical guide to fostering change in university courses and faculty by embedding discipline-based education specialists within departments. This Handbook is based on the Science Education Initiative (SEI), a transformative initiative aimed at changing STEM teaching practices in university settings. The SEI was successfully implemented in two institutions (University of Colorado Boulder and The University of British Columbia) over a period of 10 years. The SEI centered on department-based Discipline-Based Education Specialists (DBESs), disciplinary experts with training in the science of teaching and learning who serve as catalysts of change within departments. The two SEIs have influenced the teaching of hundreds of faculty and the learning of tens of thousands of students per year by promoting the use of evidence-based teaching practices in STEM. These teaching practices are informed by research on teaching and learning, and often include some element of active learning. This Handbook shares the accumulated wisdom of practice in how to effectively implement a model of change based on the SEI. It provides advice to the three main stakeholders in such initiatives: the initiative leaders who provide central direction and management, the departmental leaders who help lead the activities and engage faculty, and the Discipline-Based Education Specialists who partner with faculty to transform courses. The Science Education Initiative Handbook by Stephanie V. Chasteen (University of Colorado Boulder) and Warren J. Code (University of British Columbia) is licensed under a Creative Commons Attribution-NonCommercial-ShareAlike 4.0 International License, except where otherwise noted. All photos which appear in this work are excluded from the Creative Commons license and remain all rights reserved. UBC logos, coat of arms, and related branding elements are copyright of The University of British Columbia and may not be altered in any way or reused separate from the work without permission. For guidelines on the permitted uses of UBC trademarks, please refer to http://universitycounsel.ubc.ca/university-trade-marks/. CU Boulder logos, coat of arms, and related branding elements are copyright of The University of Colorado Boulder and may not be altered in any way or reused separate from the work without permission. For guidelines on the permitted uses of CU Boulder trademarks, please refer to https://www.colorado.edu/brand/how-use/logos/cu-boulder-logo.